The Camfil Pharmaseal® provides cleanroom level air filtration for pharmaceutical or biotechnology facilities as well as any other facility where clean space is a manufacturing or health-related requirement. Its unique room side replaceable filter design minimizes downtime and ensures repeatable room cleanliness following filter service. 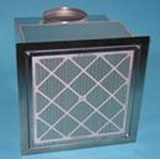 Light weight, compact, ducted filter module with lower pressure drop and lower life cycle cost. The Camfil Megalam® Terminal Diffuser module is ideal for applications where clean air is a requirement to protect products, people, and the environment. The Pharmaseal FFU is the first product designed and tested to meet the Life Science industry certification factory and field aerosol testing requirements. 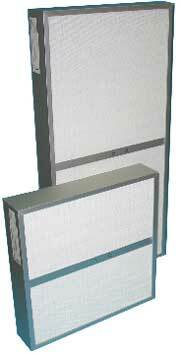 The ceiling module provides energy efficient powered clean room level air filtration. Its unique room side replaceable filter and aerosol injection system design minimizes downtime and ensures repeatable consistent certification while still utilizing the features and benefits of the Pharmaseal, the industry’s leading terminal housing. 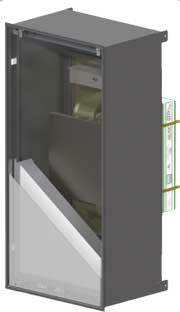 The Pharmaseal FFU incorporates electronically commutated (EC) fan technology for greater energy efficiency. The Pharmaseal® exhaust housing is a simple, yet highly effective solution for exhaust and recirculation applications in pharmaceutical and biotechnology facilities, hospitals, surgical suites, neonatal care units, animal labs, sterile manufacturing areas and the food processing and packaging areas. 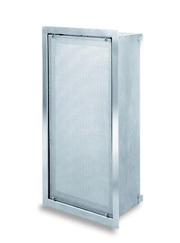 The Pharmaseal allows a maintenance friendly filter change from within the room, through a removable stainless steel filter face grille. The Camfil Slimline DCM-FD Ducted Ceiling Module is ideal for applications where minimal installation space is available and ultra clean air is a requirement. A room side replaceable ducted terminal filter housing offering high performance and ease of maintenance. The Camfil Slimline™ RSR offers leak-free performance in a compact room side replaceable module. Designed to be installed in either 1 1/2” or 2” T-Bar ceiling systems or gypsum/plaster wall board systems, initial installations and filter maintenance are simplified.